VISIONTEK Point-of-Sale terminal GL-11, with an in-built fingerprint scanner designed exclusively for Microfinance & e-Governance applications. VISIONTEK GL-11 POS terminal is equipped with ARM Cortex A9 @ 1GHz processor, Finger Print Scanner, 3.5 TFT Colour LCD display with Touch Screen and QWERTY keypad. 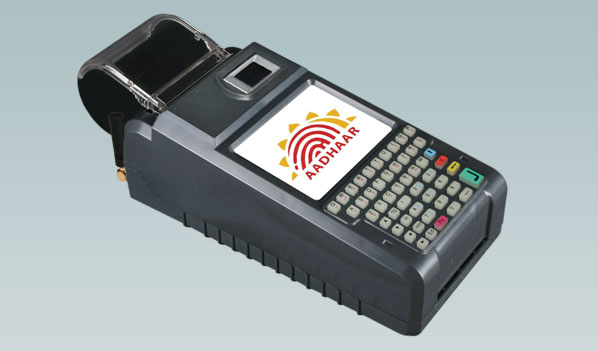 These Features are specially designed to address NREGA, Micro ATM, NPCI, UID and PDS requirements with biometric Finger Print Authentication for AADHAAR based transactions. VISIONTEK GL-11 other optional features are ISO 7811 for Magnetic Swipe Card Reader, ISO 7816 supported Smart Card Reader (optional Dual Contact Smart card reader), Contactless card reader and Finger Print Scanner. The fingerprint sensor is conveniently placed for user access. GL-11 supports rich QT GUI with Linux(3.0.35) / ANDROID(4.4.2)** and it comes with seamless connectivity options like GSM/GPRS 2G/3G Bluetooth, WiFi and Ethernet.